Stunning Essense of Austrialla Dress Style D2147, this is a stunning brand new, never been worn and unaltered dress, it's a true UK size 12 dress. Its a beautiful muscato colour (pale blush) tulle with stunning lace detail. The low cut back really has the 'wow' factor. 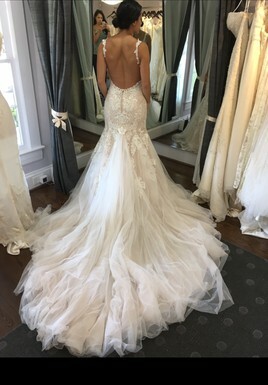 I purchased the dress from a shop called 'Georgina Scott Brides', but have sinced changed my mind on the style of dress i wanted. I paided £1899 for the dress. Please contact me for any futher information, and if you would like to come and try the dress.